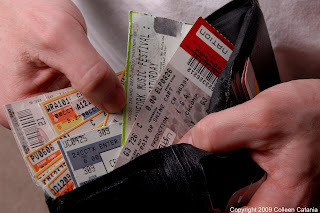 Yes, going to shows costs money. And if you’re Madonna, you can count on fans forking over at least 200 bucks to see you. And as Idolator points out looking at the top 20 touring acts of 2008 could make fans feel even more depressed about the sad state of the economy. Though many of the artists are on the Top 20 lists are not my personal favorites, they’re certainly doing something right when it comes to reaching and getting their audience to the spend the money they do have (or don’t have). But the Idolator article also got me thinking about the Long Tail and how it impacts the indie touring circuit in their effort to reach their market while still sustaining their art and bank accounts. I don’t have any hard figures, but still I ask this because I know there are independent bands that are making money touring, even if they’re not bringing in six-figures. I’ve read books and articles about the Long Tail impacting record sales, but what about touring and ticket sales? Madonna and the rest of the acts on the list didn’t start out touring arenas. Most of them had to be creative with their initial touring, whether it meant being strategic about which cities they toured or how they performed a cutting-edge show on a shoe string budget. I also know that though it might be tough (and very uncomfortable) for a band to work with less money, the up-side is that the creative factor tends to rise when you’re forced to work (and live) on a lot less. Reading Jim Derogatis’ book Staring at Sound, you can learn how the Flaming Lips did things as indie-rock legends early in their career. Their story should be inspiring to young bands touring today. I’ve also had some interesting conversations lately with artists when I ask them how they’re coping with touring costs, and some have told me how they’re experimenting with creative collaborations as they move from city to city. I believe you should always play by the rules whenever possible, but live music history has shown us that whether by illegal or borderline poverty means, genres like punk and hip hop both began amidst tough economic times–when artists were forced to be musical production MacGyver’s and get the most out of their surroundings. Yes, I’m an optimist. and I bring this up because I don’t want to see fans or artists suffer by thinking that they have to cut out live music just because the economy is tanking. Let’s get creative in the face of economic adversity. If it means cutting out things we don’t need in order to move on then so be it. Let’s just do it and get on to the next great live music discovery. Let’s see what happens when we grab hold of the Long Tail and wag it instead of letting it and the bad economy yank our love for live music away from us.